NM Scott Massey and the Kenilworth Chess Club's President Donald Carrelli showed up at the Lyons VA today. Facing the camera- Scott on left plays simultaneously with a handful of veterans. Next to him is Sgt Carrelli playing against another Marine veteran. 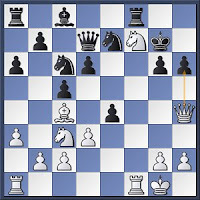 One of the games Scott shared with us was one of Paul Morphy's classic games. FYI - NM Scott Massey offers scholastic chess lessons at the Milburn Public Library during Saturday afternoons. He also heads the Tewksbury Chess Club Wednesday evenings. Thanks to Scott for sharing some stories, playing a simul, and going over some new ideas for everyone to enjoy. A couple people have reached out to me about joining us at the VA. I plan on going once a month, so please contact me if interested. One of my Montreal favorites- Cafe Pi. Whenever I visit Montreal, Canada, I make it a point to stop by this cafe. Great for a slab a pi (! ), some tea, various art pieces that frequently change, and of course...blitz chess. The atmosphere is always enjoyable. Here I am playing one of my many 5 minute games. Playing strength there was mixed- better, worse, and much worse than myself. Against this gentlemen, I got the chance to play the Grand Prix Left Hook. He didn't play into the gambit line (my favorite for blitz) but I had the typical grand prix attack. Black to move and get screwed. Black can try to hold on with Ng8, but he played Nf5 begging for the exchange sac. Game just got uglier while his queen-side pieces watched on. If you ever visit Montreal, make sure to visit this cafe. Don't worry if you don't speak French- you can get by with just pushing wood. Yaacov goes 9-1 (!) at the World Open Blitz Tournament over the July 4th holiday. I always enjoy watching his games on ICC. ICC does offer a free trial....so if you haven't used it, I suggest you do. Follow YaacovN! You can see him put to use his color complex ideas. He also gives free simuls on ICC every Friday afternoon! Check out his past lectures at the Kenilworth Chess Club.